﻿ Pro Fishing Simulator is now available! 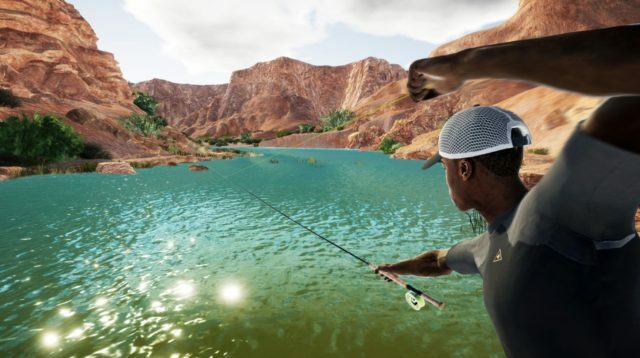 Pro Fishing Simulator is a sport fishing simulation which lets players enjoy this incredibly popular activity (more than a million French citizens love going fishing) from the comfort of their own living room. Whether you’re an expert or a novice, you’ll enjoy visiting the most beautiful fishing spots in the entire world and encountering over 75 species of realistically reproduced fish. Prestigious brands such as Strike King, Lew’s and Vision are represented in the game, which includes over 100 pieces of official equipment. 9 fishing areas, based on real locations across the world: from Seychelles to the Black Forest, and even Colorado. 6 fishing techniques: float fishing, fly fishing, line fishing, pole fishing, bottom fishing, and boat fishing. 79 realistically reproduced species of fish. Hundreds of pieces of equipment from official brands: 13 Fishing, JMC, Vision, Lew’s, Kastking, Outcast, Sea Eagle and Strike King. Pro Fishing Simulator: fishing, as real as it gets!